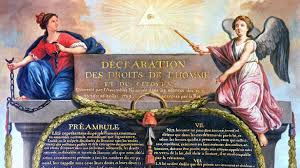 On this day in 1789, the National Assembly of France adopted The Declaration of the Rights of Man and of the Citizen. It was written by General Lafayette, Thomas Jefferson, and Honoré Mirabeau. Though it was a magnificent document, the sexist language was intentional, in that women were not given equal rights in revolutionary France. A little over two years after the adoption of this declaration, Olympe de Gouges wrote another, entitled The Declaration of the Rights of Women and of the Female Citizen (watch this space on September 5). Men are born and remain free and equal in rights. Social distinctions can only be founded on communal utility. The purpose of all political associations is the preservation of the natural and imprescriptible rights of man. These rights are liberty, property, security and resistance to oppression. The principle of all sovereignty emanates essentially from the nation. No group of men, no individual, can exercise any authority which does not specifically emanate from it. Liberty consists in being able to do whatever does not harm others. Hence the exercise of the natural rights of every man is limited only by the need for other members of society to exercise the same rights. These limits can only be determined by the law. The law only has the right to prohibit actions harmful to society. What is not prohibited by law cannot be forbidden, and nobody can be forced to do what the law does not require. The law is the expression of the general will. All citizens have the right to take part personally, or through their representatives, in the making of the law. It should be the same for everyone, whether it protects or punishes. All citizens, being equal in the eyes of the law, are equally admissible to all honours, offices and public employment, according to their capacity and without any distinction other than those of their integrity and talents. The law must only require punishments that are strictly and evidently necessary, and a person can only be punished according to a established law passed before the offence and legally applied. No man ought to be uneasy about his opinions, even his religious beliefs, provided that their manifestation does not interfere with the public order established by the law. The free communication of thought and opinion is one of the most precious rights of man: every citizen can therefore talk, write and publish freely, except that he is responsible for abuses of this liberty in cases determined by the law. The guaranteeing of the rights of man and the citizen requires public force: this force is therefore established for everybody's advantage and not for the particular benefit of the persons who are entrusted with it. A common contribution is necessary for the maintenance of the public force and for administrative expenses; it must be equally apportioned. between all citizens, according to their means. All citizens have the right, personally or by means of their representatives, to have demonstrated to them the necessity of public taxes. so that they can consent freely to them, can check how they are used, and can determine the shares to be paid, their assessment, collection and duration. The community has the right to hold accountable every public official in its administration. Every society which has no assured guarantee of rights, nor a separation of powers, does not possess a constitution. Property being a sacred and inviolable right, nobody can be deprived of it, except when the public interest, legally defined, evidently requires it, and then on condition there is just compensation in advance.